This a quick post for a friend of mine, she's asking about how to get a podcast going, as she's been using Snapvine.com, and that's all fine and dandy, it's quick and simple, and one can call into their account to leave a message. A few of my geek trucking friends, and those that like some of us truckers (it's nice that the industry has outside supporters, :) ) have used this service, as another meeting point. Sorta like Twitter but with your voice. But basicly, what one needs to get their own Cyber Radio, Podcast, Netcast, or what ever name one wants to call it. Off of the ground, they need to have a Blog of some sort that they can post messages to such as this one. OR any other Myriad of bloging tools out there. MySpace and FaceBook I think are out, as they aren't easy to add to an RSS / Podcatcher aggrigator. I personally like Blogger for a freebie Bloging tool. There are many tools out there that work with it, Next on my list would be a Free WordPress Blog, as that's one of the tools that I'm trying to learn how to use, and it's got many tools to go with it. There are others tools that can be used, and I'm not familiar with them, so I won't talk about them. I did some easy math on that problem. :P Ok, Now that a person has a Blog that is RSS compatable, they need to find a place to host the files. - Unless Blogger lets you UL a file to their site. - ? I don' think that they do. A person could also get a "basic with your own domain name account" via 1and1.com or Godaddy, and they both provide a basic Blog that will host the files for you, for next to nothin' or for the cost of registering a domain through them. - These Blogs and the blogging tools do have some limitations, but they do work, and would be a great place to start and learn "how to." AND, your content is still yours, without giving up the rights to your content and you're not subject to the whims of an outside blogging hosting site. But for the freebie not ready to comit 20-40 bucks... read on. Now we've got a Blog that can be easily caught by BashPodder, iTunes, or FeedDeamon or Juice or gPodder or Amarok, or WinAmp.... or... LifeRea or Google Reader.... But we don't have a place to host the files. File hosting. Box.net Free, and easy enough to link to. I don't use them, and they also hose the file name, but it's free, and if you don't care if your podcast is called 7G8M4.mp3 or VvV41Gg.mp3 or some other odd file name, it'll work for you. I'm picky about that kind of thing, so for me it would be a show stopper. - Or try http://www.oosah.com/ - I had problems with oosah.com with their flash uploader and my Linux machine, but if you're running Window's it ought to work for you just fine. - (I'll be booting up my windows machine sometime this week as there are some windows things that I need to do, and I've not turned on that machine for almost 3 months. Yea, I love my Linux, but I've still got some Windows issues, - I'm seeking therapy, via www.LinuxCranks.info , and other Linux NetCasts... ) But back about oosah.com. They will allow 1 Terrabyte of data of storage online. And it has ITS issues also. :P But for a learning experiance, and the price of your time and effort and being free to use, it's not a bad place to try out. how to force quit in XFCE - Ubuntu Forums: "how to force quit in XFCE"
While I was farting around whit XFCE, as I like that it is a lot like Gnome, and that it's a little snappier etc, and that I might want to know more about it if I am to use it on an old machine, or if I just want my machine to have a little different look and feel for a while. Its sorta like cheating on my Gnome Girlfriend, but not worthy of any guilt. 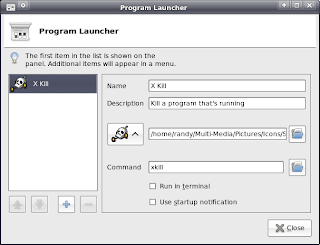 So anyway I got to the Ubuntu forums to see what I can find, as XFCE by default doesn't have a Kill Program Icon in the "Add to Panel", er "Customize Panel" list. Ok, that's cool. That works. But what about the next time? I want a darn icon on the panel so that I can click click kill and get. To get this, I did thus. Next you need to fire up the GIMP and open the first frame. Next we need to open all the frames as layers. Then hold CTRL and click on your first frame to deselect it and then open the files. Hit CTRL+L, that will bring up the layers. All you have to do now is save the image as a GIF and choose to save it as an animation. I'm playing around with it and hope that it'll get settled. Would love the IMAP email function, without flaws. How to R&R broken laptop hinges. Toshiba Satellite A45 manual. How to remove and replace broken laptop hinges. Toshiba Satellite A45 manual. I used this guide for my older laptop, as one of it's hinges was shot. I'm glad I ordered both sides, as I the second one gave way during the dis-assembly process. I don't know what it is about this machine, well actually, I do. I love this hardware. This machine has it's stock install of XP on it, and yea, It's about time for a fresh re-install due to the installed-uninstalled stuff over the past 5 or so years. I've upgraded its Ram and the Hard drive twice, and it just keeps on ticking. It lacks a built in WiFi Adapter, and DVD burner, but hey, it's solid with XP and every Linux Distro that I've tried with it runs 100% right out of the box. The lack of a built in WiFi card helps with that number. It's only down side is it's size and weight, and power consumption. My newer Satellite is lighter has a larger screen, but the sound card and Ubuntu aren't playing nicely. But Elive did. - Might try that one day, but still prefer something that I can setup that has more of a XP feel to it, so my mouse finds things easier when I go from one machine to another. Note to self. Send a donation their way. Here is Solveig Haugland's Tech Target article. The OGG days of Summer OR The Joy of a MP3 and Me. You know, I was chatting with Nathan Hale on Twitter about MP3 players. 140 characters is not enough. So I'd like to add what my experiences have been with my MP3 Players. Lemme start with the first one that I've ever bought, and will never by again. Mind you, this was around 2005 A 128 Meg Rio Forge. I picked this model as it had a SD Slot and would work with Audible.com's DRM'd audio books. I bought 2 of them, both of them craped out after a month or so of what I'd consider normal use. The second one was a refurbished model, so after the luck with it, I moved on to Creative Lab's MUVO models. I will NEVER recommend one of these or purchase another RIO product. I LOVE the Creative Labs MUVO's. Sturdy, and reliable. I've I expect that after a over a years worth of serious use, I've gotten my money's worth. I have had the 128 Meg, 512 Meg, and 1 Gig models. None of these have an external drive slot. But will work well with with Audibles DRM, but no joy in hacking their Firmware. Other the the lack of OGG support I'd HIGHLY recommend any of the Creative Lab's products. I've thought about getting a Zen. One of the little nuances that one finds with listening to a Podcast or Book is that you want your player to start up right were you left off if it powers down, or you turn it off. One of the downsides of a Muvo is that if you've been listening with it for 4 hours straight, and the battery goes dead while you're listening to it, it will go back to the last place saved. Eh, I can live with that. Powered via a AAA battery. A rechargeable or Cheap-o battery lasts about 8 hours of use, a New Duracell will last closer to 12 of constant use. So if you're planning on taking one camping, keep this in mind. SANSA: I have two Sansa e250's one I Rock boxed, and when trying to update the version of Rock Box I ran into a snag, so I went to completely remove Rock Box and ended up bricking the dang thing. I should have left well enough alone. But I'm a hacker and tinkerer. Do I Blame Sanasa for this? Nah. They weren't the one's messing around with it. I was going to do something fancy with a second e250 that I had bought, but since I bricked the first one, and until I find out where I can get the e200tool, as it's supposed to help un brick the sucker. Until then, I'm going to hang out with the standard interface on the other one that I have. But up until the time that I started mucking around with Rock Box on the 1st Sansa e250 it was working ok. Battery was draining a little faster then I expected, but oh well. But these charge off the USB port, and charge should last at least a day of normal use. I also have a Sansa e140 and it's ok, and but it does one thing that I simply hate, and won't keep it around for podcasts or books. It's fine for music, as it won't bookmark your current spot in a track. It runs off a AAA battery. Part of the ensemble on my dashboard. (Over the road trucking will cause this) Is a VR3 FM modulator. Works good, can get blasted from outside FM signals depending on where you are, but you can move them around with the presets. Great if all you want to do is listen to music, as there isn't any bookmarking, if you loose power to the Cigarette lighter, it goes back to track 0. It works good to plug a USB cord into (say a Sansa e250) to charge you MP3 player. It also will play the non DRM tracks off of the Muvo if you plug it into it also. But it just reads the Muvo as a standard USB flash drive. A challenging and interesting position which will utilize my computer skills, and skill set as a customer service representative, as well as other jobs and duties that I have performed. Technician - Technical service for Lottery Terminals, Medical Equipment, equipment usage, installing equipment, diagnosing and troubleshooting, maintenance, technical support, and training of all systems. Customer Service Representative - Training retailers to use software and related equipment; liaison between Gtech and State Lottery Office; Was on original Start Up team, bringing the on line lottery to California. Web Master - Created and maintained web pages for various projects. Created and edited images using The Gimp, Microsoft Front Page 98, Photoshop 8, Adobe 4.0, and made use of Java Applets. Certificate of Completion for "Gtech Customer Awareness Program". Certificate of Completion for CSR/Communication "Last Mile Training Program". Certificate of Completion for CSR Retailer Training Program. Perfect Driving Award for 5 consecutive years. Manager.Human Relations Skills: Took course to handle situations in which retailers become hostile. I find it exciting to look back and see the personal computer go from the CoCo's, the C=64's , and the Atari to the machines we have today. Looking back, to what we have now, it is kind of amazing. From little machines that ran BASIC to the GUI interfaces of Apple , Windows, and Linux. Those little machines that ran Basic could only hope to connect via a modem to a BBS or one of the larger super systems like AOL. And the machines of today connect to the World Wide Web. And currently most of us have enjoyed pretty much an unlimited amount of time online, and a unlimited amounts of download capacity. That's going to change. The places where we connect to the web want to start to meter our usage. All at the time when there's movies to download, or upload. YouTube videos to stream. Music to listen to via a stream or DL. All when Podcast content from creative and scrappy internet evangelists of our choice are offing content at an astounding rate. So much so, that I, and I'll admit I'm not the norm, don't spend much time with broadcast TV or Radio. Sure there's a few programs that I enjoy, but very few, and I find them from word of mouth recommendations. Bob Frankston has written a few articles about the shape of the data transport of the future, or how it could be. Or as I hope. It will become. It's a little hard to wrap one's head around a new idea at times, but Mr. Frankston has it nailed down. I'm envisioning data being transported from little devices about the size and shape of our cell phones and using just as little power. Little enough that they could be powered via solar panels. All connected via a mesh network, and senders and receivers of data wirelessly. All it's going to take is for a neighborhood to connect themselves to each other. It wont matter if it's via Copper, or 802.11, or Packet Radio. Want an internet connection? Just fire up the machine that you own, choose a connection method that fits your needs, and you're on. As he's pointed out, we've already created the way to do it. It's right here. Right now. All we have to do is create it by connecting ourselves to each other without Ma Bell or ComCast. So, since I've become an open advocate of Open Source Software, Linux, and uber geekieness I've found out about .ogg files, or also know as Ogg Vorbis a free and open source alternative music and video compression method. The mp3 format isn't open source, or even a"free" format even though it's widely used. For those of you who would like a quick link to the tar ball for Rock box, try this link. Index of /rbutil/linux If it doesn't work, (as link rot happens) just go up one level, [ http://download.rockbox.org/rbutil/ ] and look for the current version. DL the software, and un-compress. I downloaded it to my Ubuntu 7.10 desktop and uncompressed it. Moved the new folder into my home folder and just clicked on the executable. Ubuntu ran the file just fine. Run the software, with your MP3 player plugged into the USB port, if you haven't done so already. I found it fairly straight forward to follow. I DL'd and installed all the different themes, fonts, and the Doom game. I didn't get any sound out of the DOOM game, but I might not have had it setup right, and as of this moment, fixing that was low on my priority list. :) I found navigation with Rock Box on my player took a little getting used to. Options Options, and more options that were never available via the stock Sansa software. But once I explored and figured out how to get it to startup in the window that I want (yea there's that option) found a theme with large fonts that are easy to read, not that I need to see them, as one of the features is that my player now talks to me. Rock box doesn't work for all mp3 players, so go to http://www.rockbox.org/ and browse the site for your player.